In November 2011, ten national and international civil society organisations, including Down to Earth, highlighted concerns about human rights in Indonesia, in a report about human rights and natural resources management and climate change. The report was submitted under the UN's Universal Periodic Review - a process which reviews the human rights record of all 192 UN member states once every four years. 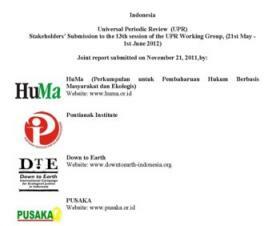 In June 2012, Indonesia will be among the countries to be reviewed in a meeting of the UPR Working Group. The documents on which the reviews are based are: 1) information provided by the State under review, which can take the form of a “national report”; 2) information contained in the reports of independent human rights experts and groups, known as the Special Procedures, human rights treaty bodies, and other UN entities; 3) information from other stakeholders including non-governmental organizations and national human rights institutions. The ten CSOs submitted their report, dated 21st November 2011, as part of this third category. On this page we highlight the paragraphs in the review which concern the MIFEE project. For the full Stakeholders’ Submission to the 13th session of the UPR Working Group, (21st May - 1st June 2012), submitted by HuMa, Pontianak Institute, DTE, Pusaka, WALHI Kalteng, AMAN, FPP, Yayasan Merah Putih and RFN, click here. We would also like to draw attention to the human rights impacts of Indonesia’s policies and legislation aimed at promoting the development of agrofuels as an alternative to fossil fuels. Increased production of crops including palm oil, jatrophaand cassava is being actively encouraged by the Indonesian government in order to meet domestic and international demand for alternatives to fossil fuels, particularly under climate change mitigation plans. These policies are contributing tothe accelerated and intensified proliferationof large-scale plantations in many parts of Indonesia, and the emergence of mega-projects such as the state-initiated Merauke Integrated Food and Energy Estate (MIFEE) agro-industrial scheme in Papua. Such projects are leading to the displacement of communities who live in areas targeted by industrial plantation developers, and the subsequent loss of their sources of livelihood, culture,identityand human dignity. The MIFEE project encompasses around 2 million hectares of land which is the customary land of the Malind and other indigenous peoples of Merauke. Thisland is being appropriated by large companies with state assistance and without any regard forthe internationally guaranteed rights (of property and others) of these indigenous peoples, leading instead to the nullification of these rights.The negative human rights impacts of Indonesia’s reservations on Article 1 of the International Covenant on Civil and Political Rights and the International Covenant on Economic, Social and Cultural Rights are becoming increasingly evident as the MIFEE project proceeds. Thishas been outlined in recent submissions on behalf of the affected communities to the Committee on the Elimination of Racial Discrimination, the Special Rapporteur on Food Security and the Commitee on Economic, Social and Cultural Right The Chairperson of the CERD has already expressed their concern regarding this project to the Indonesian government. Invite UN Special Rapporteurs for Indigenous peoples, Adequate Food, Women, Children, Human Rights and Access to Safe Drinking Water and Sanitation; Human Rights and Transnational Corporations and Other Business Enterprises; and Effects of Economic Reform Policies and Foreign Debt on Human Rights. Specifically, the Government of Indonesia is urgently requested invite the Special Rapporteur on the Right to Food to visit the MIFEE project area in Merauke, in line with the request submitted on behalf of indigenous communities in Merauke to the Special Rapporteur on 9 August 2011; and invite the Special Rapporteur on the situation of human rights and fundamental freedoms of indigenous peoples, as requested by the Chairperson of CERD in his letter to the Indonesian government concerning MIFEE, dated 2 September 2011. Heed the call to immediately suspend the MIFEE project until such a time as indigenous peoples’ rights have been demonstrably secured in law and practice – in particular,their ownership rights to their traditional lands, territories and resources and their right to give or withhold theirfree, prior and informed consent to any further development thereon. Request for Consideration of the Situation of Indigenous Peoples in Merauke, Papua Province, Indonesia, under the United Nations Committee on the Elimination of Racial Discrimination’s Urgent Action and Early Warning Procedures,United Nations Committee on the Elimination of Racial Discrimination, Seventy-ninth session, 08 August – 2 September 2011, Submitted by Sawit Watch and Forest Peoples Programme and 11 other organisations, 31 July 2011. Letter to Olivier De Schutter, UN Special Rapporteur, Right to Food, IHCHR-UNOG, re: Request for Urgent Assistance to Address the Imminent Threat to the Right to Food of the Indigenous Peoples in Merauke, Papua Province, Indonesia, signed by Abetnego Tarigan, Sawit Watch and Fergus Mackay, Forest Peoples Programme, on behalf of 22 submitting organisations, 9 August, 2011.Letter to Ariranga Govindasamy Pillay, Chairman, Committee on Economic, Social and Cultural Rights (CESCR), re: Indonesia’s Ratification of the Covenant and Failure to Submit its Initial Report, signed by Abetnego Tarigan, Sawit Watch and Fergus Mackay, Forest Peoples Programme, on behalf of 22 submitting organisations, 9 August, 2011. Letter from Anwar Kemal, Chairperson of the Committee on the Elimination of Racial Discrimination to H.E.M.Dian Triansyah Djani, Ambassador, Permanent Mission of Indonesia, Geneva, September 2nd, 2011, Reference GH/ST. See also Request for Consideration of the Situation of Indigenous Peoples in Merauke, Papua Province, Indonesia. United Nations Committee on the Elimination of Racial Discrimination, Seventy-ninth session, 08 August-2 September 2011, submitted by 13 civil society organisations on behalf of the indigenous peoples of Merauke.